Nxabega Okavango Tented Camp is set in a private concession of 8 000 hectares (19 800 acres) to the southeast of the Moremi Wildlife Reserve in the center of one of the most unique regions in the world, the Okavango Delta. 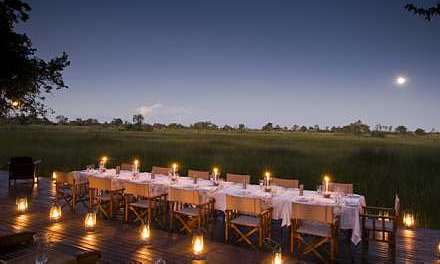 Meaning “Place of the Giraffe,” Nxabega is ideally positioned to explore the magnificence of the Okavango. The wide open channels of the Delta spread in front of the camp, perfecting viewing from your individual tents. All tents are elegantly furnished with closets, luggage racks, chairs, dressing tables and side tables. The magnificent elevated main building is constructed in local timber, reed and thatch with sweeping views over the plains in front. It’s very cozy and doesn’t try to be anything it isn’t.